Make this easy gluten-free strawberry pie recipe with fresh or frozen strawberries. Just 5 ingredients, plus coconut flour crust! 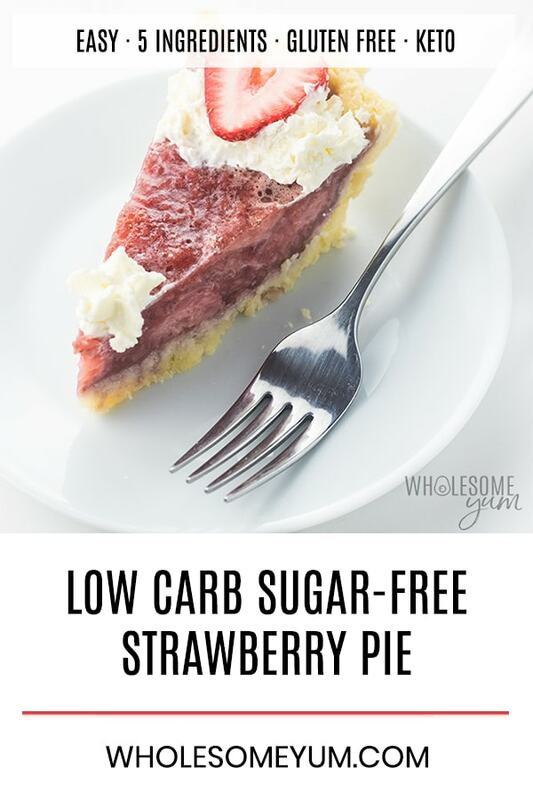 Sugar-free strawberry pie is low carb, keto, and has a paleo option. A few months ago I made strawberry sugar-free gummy bears. As I was simmering the strawberries, it occurred to me that they would make an amazing sugar-free strawberry pie filling! 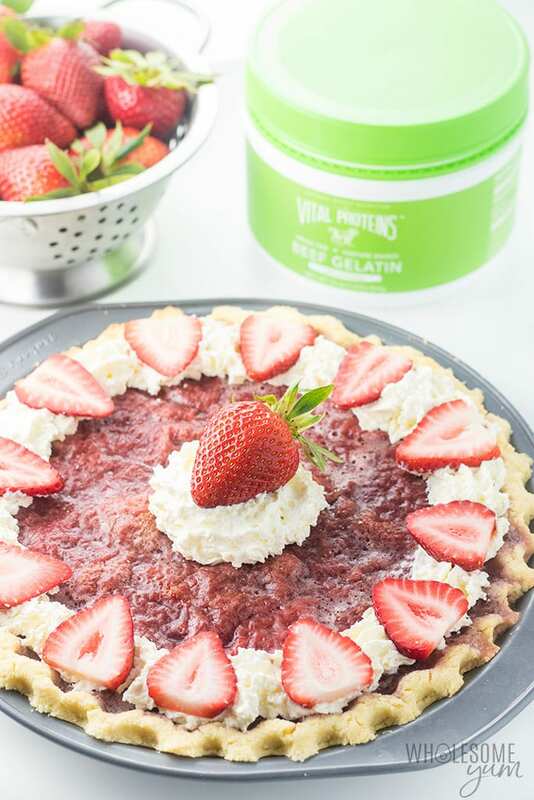 And now that summer is here, it’s the perfect time to finally make that low carb gluten-free strawberry pie recipe idea a reality. I think you’re going to love it! There are a couple of crust options for a gluten-free strawberry pie. 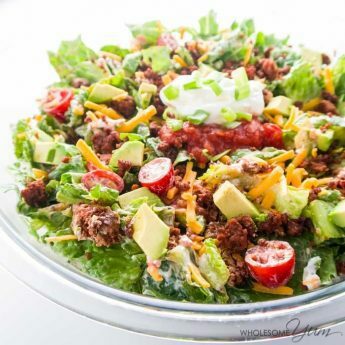 Some people use a baking mix, but I prefer to use simpler flours to keep my crust low carb. 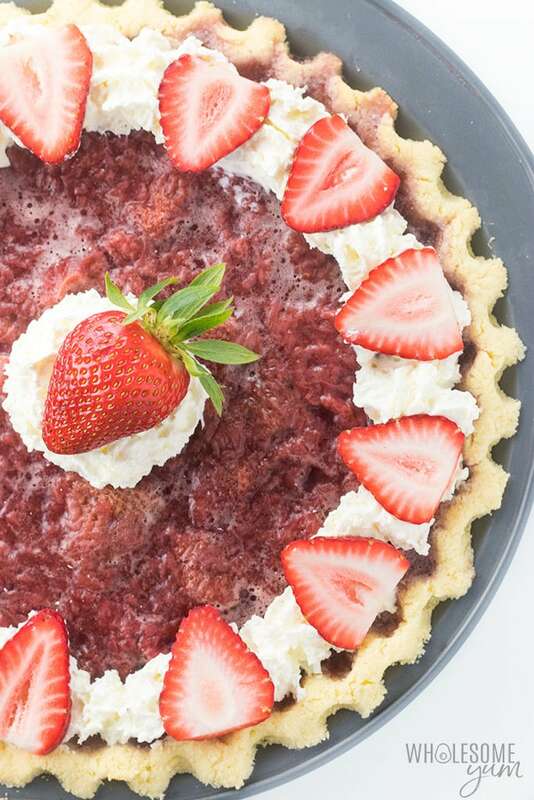 This sugar-free strawberry pie recipe is made using a coconut flour pie crust. It’s nut-free (coconuts are not actually nuts!) and has a dairy-free option, too. If you prefer, you can use an almond flour pie crust instead. I actually slightly prefer that one, but both are delicious! And, each has only 5 ingredients, making it super simple to whip up. You probably know that strawberries hold a ton of water. So, unless you’re making a no bake pie using fresh strawberries, any version that requires a cooked sugar-free strawberry pie filling needs something to thicken it. Most strawberry pie recipes use a starch to thicken, like cornstarch or tapioca. Neither is low carb friendly. Others use store bought jello, which is either filled with sugar or artificial sweeteners. No, thanks! Fortunately, there’s a better way. 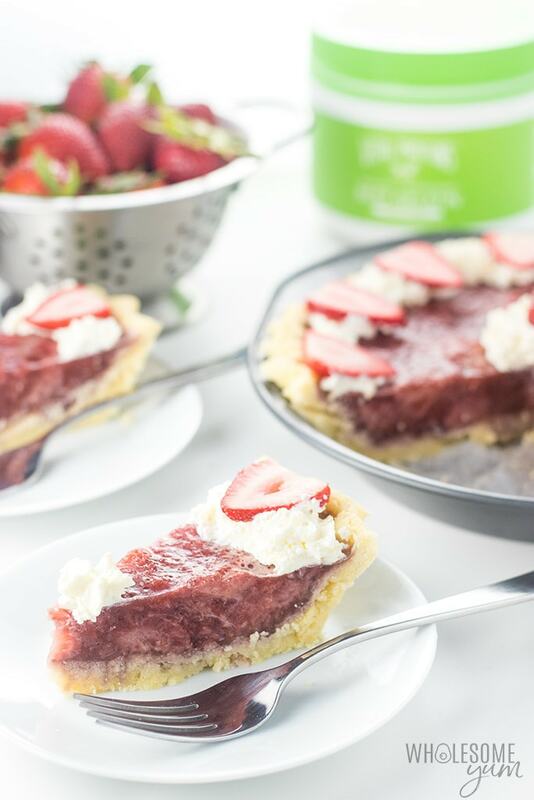 Instead of processed jello, this strawberry gelatin pie uses my favorite grass-fed beef gelatin from Vital Proteins. It gives you all the benefits of collagen that come with it, without sugar or processed stuff. 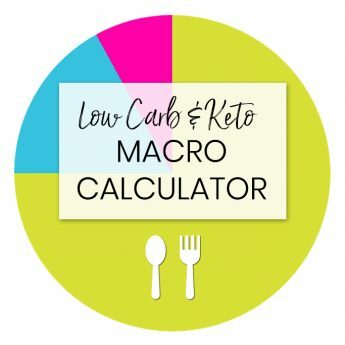 Powdered sweetener – you can use any kind you like, so check my low carb sweetener guide for options! It’s summer right now, so I made my gluten-free strawberry pie with fresh strawberries. But, I’ll tell you how to make strawberry pie filling with frozen strawberries, too. You can decide what you want to use. To save time, you can make the sugar-free pie filling in parallel while your crust is baking. Start by combining the sweetener and strawberries in a large saucepan, and turn the stove to medium heat. You can use fresh or frozen strawberries here. The process is actually the same! If you are using fresh, you can slice them in half first or just remove the green parts and put them in whole. It’s up to you what size strawberry pieces you want in your healthy strawberry pie. Making the sugar-free strawberry pie filling is a lot like making a strawberry sauce. The strawberries will be dry at first, but will start to release water as they heat up. Eventually they will start to simmer. Continue simmering the gluten-free strawberry pie filling until the berries are soft. The time will vary depending on if you used fresh or frozen strawberries, as well as other factors like their size and stove temperature. Meanwhile, whisk the gelatin with some water and lemon juice in a small bowl. Work quickly, because the gelatin powder will start to set once it mixes with the liquid. Let it sit for a couple minutes to thicken. Important tip – check the thickness of the gelatin mixture! You can see what it needs to look like in the video below. It should be thick, but not solid. If it solidifies like jello, you may need to add a bit more water. When the berries have softened, you’ll notice quite a bit of liquid in the pan. Whisk in the gelatin mixture while heating, until it dissolves. If you’re having trouble dissolving it, you can turn up the heat a bit. That’s it! You’ve made the strawberry gelatin pie filling. It won’t be very thick yet, because that happens later. Now comes the hard part – waiting! 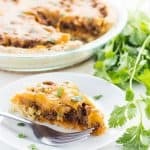 The filling and crust need to cool separately for about 20 minutes, so that they are not piping hot. If you don’t wait, the filling will absorb into the crust. 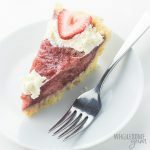 Once both are warm and not hot, you can pour the sugar-free strawberry pie filling into the crust. And then – sigh – more waiting. Let the strawberry gelatin pie cool to room temperature on the counter, then refrigerate for at least several hours to set. The easiest way is to stick it in the fridge overnight, and by morning you can be sure that it’s set. Otherwise, you can check on it in a few hours. It’s ready when the filling is firm, like a set gelatin. My favorite way to serve gluten-free strawberry pie is with whipped cream on top and more fresh strawberries. But, it’s up to you! 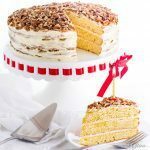 If you’re dairy-free or paleo, you can omit the whipped cream or try whipped coconut cream instead. And if you don’t have fresh strawberries, feel free to either skip them or even substitute some other berries. What about making sugar-free strawberry pie ahead of time? Or storing leftovers? Whether you’ve cut it open or not, the answer is the same. Always keep the sugar-free pie in the fridge, and don’t freeze it. Like most strawberry pie recipes, it will last a few days refrigerated. Bake the coconut flour pie crust according to the instructions here. Meanwhile, in a large saucepan over medium heat, simmer the strawberries with powdered erythritol for about 15 minutes, until strawberries are soft. Stir occasionally. While strawberries simmer, whisk together the gelatin, water, and lemon juice in a small bowl. Let sit for a couple minutes to thicken. Whisk the gelatin mixture into the strawberries. Simmer for a couple minutes, stirring/whisking until the gelatin dissolves. Let the strawberry filling and pie crust cool separately for 20 minutes. Pour the strawberry filling into the baked pie crust. Cool on the counter, then refrigerate overnight to set. Garnish with whipped cream and fresh strawberries to serve. Click or tap on the image below to play the video. It's the easiest way to learn how to make Strawberry Pie! That looks so good. Thanks for the video! You’re welcome, Debbie! Hope you like it! What an outstanding website! 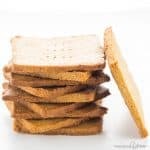 Brilliant resource for healthy gluten-free recipes. Added you to my favourites. Thanks so much! I am so happy you liked the pie, Samantha! Thanks for stopping by! Do I have to use the grass fed vital protein gelatin or can I substitute with unflavor gelatin. If it can be changed to the unflavor gelatin how much I need? Hi Tania, You can use unflavored gelatin, and though I’d guess the same amount, I haven’t tried to vouch for the results. I prefer the benefits of Vital Proteins grass-fed gelatin. 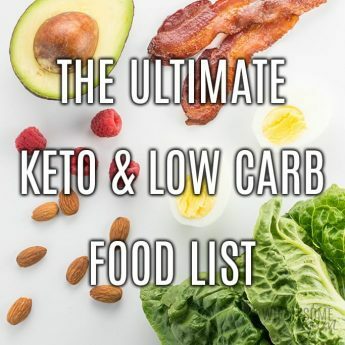 I am so excited I love your site and I want to say thanks for all your beautiful yummy keto recipes. 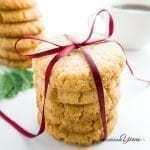 My question is, could I use almond flour instead of coconut? Thank you so much, Leila! 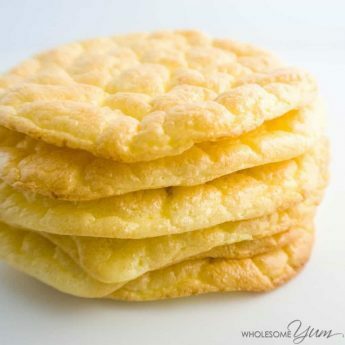 If you want to use almond flour, use this almond flour pie crust recipe instead. Hi Pamela, It depends on the recipe, but mainly the gelatin sets as it cools. It also acts as a binder in a batter, like crepes. 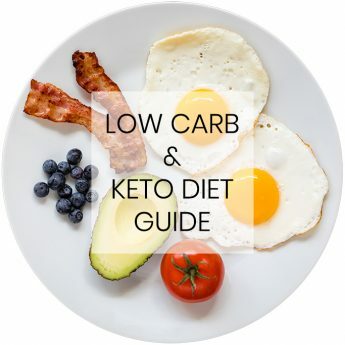 Having trouble finding bread and cake substitutes in low carb. Have made this crust twice and enjoyed. This early summer I froze at least 20 lbs fresh strawberries. 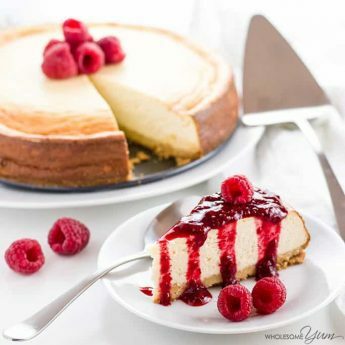 First pie recipe I have seen that can use frozen strawberries. Is very tasty. I struggle finding right sweetner combination, but will keep trying until I get it right for us. Thank you. Great recipe. Thank you so much, Jennifer! I like the flexibility to use fresh or frozen berries, too. Sweetener is definitely a personal choice so you can taste the filling and adjust to your liking. Think I’ll add some rhubarb as well. This recipe looks great, would I be able to sub half the strawberries for rhubarb? My Grandmother used to make me fresh strawberry rhubarb pie with strawberries and rhubarb on our property. I noticed this morning that my rhubarb is getting pretty huge and my strawberries are a decent sized, then I saw your email with this recipe and thought ‘Grandmother must be giving me a sign!’. Hi Joel, Yes, I think you can. The only thing is the resulting liquid might change, so you might need to add some water and tweak the sweetener as well. Check the video to see how liquid the result should be. I haven’t tried that yet, so let me know how it turns out!